â€œThe legislation that we authored, and which passed the House yesterday with overwhelming bipartisan support, would not allow any taxpayer funds to be distributed to illegal immigrants. Continue reading MythBusters: Plane on a Conveyor Belt. * Did Hillary Clinton really win in Florida? Continue reading A Handful of Political Stories. I've offered up a few comments inline on each below. Continue reading A Few Tech and Security Links. The ACLU has an excellent refutation of President Bush's assertions on FISA reform during the State of the Union address last night. A quick read, highly recommended. As I've already pointed out, his assertions are based solely on FUD and no valid or legitimate concern for the ability to collect intelligence. "This is all, of course, beyond the pale when compared to the knowledge that the Bush administration sought expanded wiretapping powers before 9/11. The President would have you believe that his administration has gone above and beyond to protect America after the attacks of 9/11, when, in fact, his administration was in the midst of an executive power grab months before the attacks." It's still early, so not going to spend a lot of time going into this. Bruce Schneier has an excellent article posted today on "Security vs Privacy" - looking at how it should not be framed as a "vs" comparison, since the two concepts are compatible. A very interesting, worthwhile read. Also, from the files of "be careful what you put on the Internet," 4 teenagers in Minnesota have been disciplined for posting pictures of themselves consuming alcohol on their Facebook pages. Oops. This seems to be part of a larger trend, as I've seen probably half a dozen such instances just in the past week. The best rule of thumb is this: don't even take the picture, let alone posting it in a public forum. Duh. I do, however, wonder about the legality and admissibility of these works. Somebody else's problem to solve today. Sorry, I lied! I forgot that tonight was the State of the Union address. You can get the full text here. I just wanted to share a few quick thoughts and quotes. Mainly, this is same-old same-old, very optimistic, and equally deluded on the standard topics of the economy, Iraq, No Child Left Edu^H^H^HBehind, FISA reform, and so on. In the name of brevity, let me get right to the quotes and comments, in order from the speech. Continue reading The (dysfunctional and deluded) State of the Union. Referenced in this article here, The Logic of Life: The Rational Economics of an Irrational World sounds like an intriguing read. It's on my "wish list" at Amazon now, so we'll see when I can get to it. I only have 19 other books in front of it, plus the one I'm currently reading, plus all the news rags I've gotten for free that pile up on a weekly basis (Time, btw, is worthless and has been cancelled - maybe more on that another time). Continue reading Interesting Book on Game Theory. As I've mentioned on a few occasions recently (see here, here, and here), FISA reform, such as in the form of the so-called "Protect America Act," is very bad for this country, in terms of privacy, national security, and civil liberties. I wanted to spend a little time, however, exploring this concept of "FUD" and why it's a dangerous argument. Continue reading The Use of FUD in the FISA Debate. Venerable InfoSec veteran/forefather, Steve Bellovin, has a post on his blog about the security risks related to the so-called "Protect America Act" (aka FISA amendments/reform). He and a number of other infosec Ã¼ber-geeks have penned an article for IEEE Security & Privacy on the topic. Hey there, just want to post a few very, very brief thoughts on politics, mostly with links to Think Progress. First off, Obama seems to have won the South Carolina primary, and quite handily. Woohoo! I'm still working my way through his book, The Audacity of Hope: Thoughts on Reclaiming the American Dream , but thus far I've liked what I see. We could definitely have much worse people in the White House. Second, crybaby Bush has threatened to veto a 30-day extension to the amended FISA laws, which would technically be a win for him. Why? Well, because he's a wanker, naturally, but more on point, he wants to force the law to become permanent. As I've mentioned before, this law needs to be sent into exile, not lengthened, strengthened, or made permanent. Call your Senators today! Third, it seems that El Presidente is also finding this whole "freedom of information" thing to be too hard for him to handle. So much for transparency in government. As such, he's trying to roll back decades of progress in transparent governance initiatives. Luckily, 1 year is unlikely to be enough time for him to make (more) progress, marking him down as an obstructionist more than anything else. Last, I've mentioned before how scary I think Huckabee is. Well, as if you need more proof, let's add this little tidbit: he still thinks there are (or were) WMDs in Iraq. If we use Bush as a measure for presidential qualifications, then I suppose this immense degree of lunacy makes Huckabee eminently qualified. Umm... so, let's hope some other idiot gets the GOP nomination, not that the Huckster wouldn't be an easier foe to defeat. So, there ya go, nice, simple and to the point! Aussie Open: In With the New? We could potentially subtitle this as "Serbia takes on the world of tennis" in the grand scheme of things. For those who don't follow tennis, let me sum things up for you in a quick nutshell. The Australian Open is currently going on in Melbourne. It's the first of the Grand Slam tournaments of the year given their southern latitudes. This weekend will be the final matches. Going into the tournament, Justine Henin and Roger Federer have completely dominated singles play, both easily establishing and maintaining their position at #1 in the world in their respective leagues (WTA for Henin, ATP for Federer). Both were expected to do well in the tournament, as were two American sisters, Venus Williams and Serena Williams. In the end, none of them made the finals, and Serbian players are the reason. Continue reading Aussie Open: In With the New?. URGENT: Call Your Senator - Say NO to FISA & Telecom Immunity! Here we go again... the Senate is debating FISA reform again... but wait, it's great news, because the Senate is in a hurry! Apparently they all want to go to Davos for the financial conference, so their answer is to quickly approve the bloody law, rather than do the right thing. Argh! It's time to make your voices heard, once and for all. Tell the Senate "NO NO NO" on FISA, and "Definitely NO" on Telecom Immunity. If the telecoms were acting in good faith based on government requests, then they have no reason to fear prosecution. Granting them retroactive immunity - which in and of itself is questionable and possibly illegal - will only suppress information about Bush's illegal wiretapping program. Call your Senator today! You can find their contact information in the Senate directory here. Don't have time to call? Then take 2 minutes to use the EFF site here to send an email. This is a fight for doing what's right, rather than what's easy. 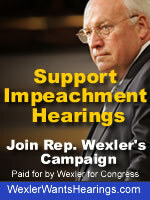 More importantly, this is a fight to begin holding the Bush administration responsible for their illegal activities. It's time to stop the spying! Roll back the leading tentacles of the Bush police state now! Apparently El Presidente has a picture that he loves greatly and associates with his personal religious beliefs. Without any reason to do so, he concluded that it shows a Methodist evangelist spreading the Good Word. Well, it turns out he couldn't be more wrong. Read the whole story over at Harper's Magazine. If you hadn't heard, a fellow named David Ritz was ruled against in a North Dakota civil case earlier this month for finding information on alleged spammer Sierra Corporate Design. At the core of the case was Ritz's use of DNS zone transfers to determine the full extent of named servers within Sierra's network, which was ruled to amount to unauthorized access. The conundrum is this: in general, access to network services is presumed on the Internet to be implicitly authorized, unless labeled otherwise. Furthermore, even if the network service is misconfigured to provide more information than is desired, it is still generally assumed that the information is "public" by virtue of being available. Unfortunately, as Rasch explains, in the ND case, intent was also factored into the equation. So, just because Ritz could perform a DNS zone transfer does not mean that he was authorized to do so. This conclusion is somewhat specific to DNS zone transfers (we hope) because it is an area where there isn't necessarily a good case for demonstrating implicit permission simply because the query can be performed. Again, itâ€™s a close call. Under other circumstances, a court could easily conclude that the use of a particular command was, in fact implicitly authorized. Security researchers use publicly available and widely used tools to probe Internet accessible computers all the time. Courts in the future are likely to look both at the motives of these researchers and the impact of what they do in deciding whether or not their actions give rise to civil or potential criminal liability. So we need to learn to play nice with other children. "Don't Tell The Fuhrer The Cowboys Lost"
I received the DVD edition of Black Adder: The Complete Collector's Set for Christmas this year, and have recently completed watching all episodes. This is some darned funny stuff! I'm a big fan of British comedy already (Eddie Izzard is one of my favorites), and am likewise a fan of Rowan Atkinson (more often known as Mr. Bean here in the US), so this was just perfect. Add to the mix Hugh Laurie (aka "House, M.D." from the Fox series), and you get a fairly complete picture of humor and inanity. The first season wasn't nearly as good as seasons 2-4, I think because it was a new series just trying to establish itself. But, Atkinson really gets going well in the Blackadder II, ending spectacularly with the introduction of Hugh Laurie in the last episode ("remember the sheep?" "oh, no, that was you?!?"). HL plays a marvelous counter-lead throughout season III as the Prince Regent, with lots of funny faces. Atkinson is by this point very classic. And let us not forget Tony Robinson as Baldrick and his famous line "Sir, I have a cunning plan." I have a signed first edition signed copy of Oliver North's autobiography, Under Fire, that I've put up for auction on eBay. Would you like to buy it? Please? :) In all seriousness, I bought it after hearing him speak on his book tour, many moons ago, when I considered myself a Republican (before the betrayal of the so-called "conservative movement" that is anything but conservative). I found it while going through some old boxes of stuff in my parents' basement over Christmas. ThinkProgress puts out a daily news round-up called ThinkFast. Today's edition has some real gems in it, such as the ineffectiveness of Bush's foreign policies and his trip to the Middle East, or that former Senator Lott's appointed replacement may have committed a major ethics violation. Or, that a panel is recommending doubling the gas tax in order to fund major transportation initiatives, even though gas prices are going through the roof (kind of a catch-22, really - need the tax to pay for high-speed rail, etc., but it makes the problem worse in the short-term). I'm a big fan of the notion "if you're going to screw up, you might as well screw up in a major way, and at least you will have taken a chance for radical change." But, there is a limit, and that would be common sense. To that end, I'd like to cry "foul!" and declare a point of order in the so-called "universal healthcare" debate. To those idiot politicians, such as from the grand states of Massachusetts and California, please take note: Requiring people to buy health insurance IS NOT universal healthcare coverage. Continue reading Point of Order: Universal Healthcare. I mentioned this earlier in my blogroll post on politics and economics, but Shawn provides a much more in-depth critique of how scary this Huckabee joker really is. I mean, it's not that I'm opposed to someone with religious convictions being president. It's just that when he argues that the US Constitution needs to be amended to align with a specific religion (in this case Christianity), then it becomes painfully clear that he simply does not get it. The whole point in the Constitution about freedom of religion is that the State should not be sponsoring/promoting one religion over another, specifically because this practice of having an official state religion caused many centuries of hardship in Europe. It's History 101, really, and it's apparently a subject that the ol' Huck-meister seems to have missed. Continue reading What I've Been Reading: Politics & Economy. * IT Security Compliance: What are the Critical Success Factors? Continue reading What I've Been Reading: Security. * Steve Jobs Speaks. Twitter Goes Down. Continue reading What I've Been Reading: Miscellaneous. I'm very happy to introduce you to the first spawn of Hanna and me. For now, we'll dub this wee one "Baby Tomhave" (ok, fetus is probably more accurate, but for the sake of consistency). 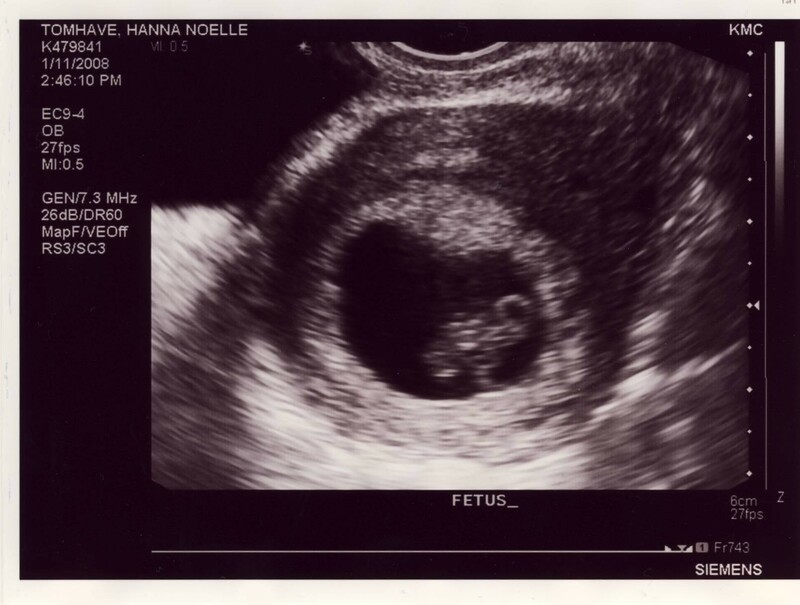 This sonogram was taken on Friday, 11 January 2008. We don't have an official due date yet (too early), but we personally estimate it to be around the end of August. Yes, my poor, lovely wife will be enduring the third trimester through the core of the hot, muggy East Coast Summer. Ah, well. More updates will be posted as they're available. Suffice to say that Hanna is doing quite well thus far, if not a bit tired. Hopefully the first trimester will be smooth, and then we'll be good to go. Pasta That's Good For You! Do you like pasta, but are disinclined to eat it because of all those carbs? Now there's an alternative that might just make you take notice. Barilla has the Barilla Plus product line that has whole grain pastas fortified with extra protein, vitamins, minerals, and Omega-3 fatty acids. And, 1 out of 1 Hannas agree - it tastes yummy! :) Just thought I'd pass this little tip along. Check out the nutrition chart for it on the right. The illegal detention center at Guantanamo Bay, Cuba, has been in existence for 6 years. It continues to be a shining example of the injustice of this prolonged war on democracy and freedom, and demonstrates with clarity and certainty that the Bush administration has no respect for the rule of law. Join with the ACLU and protest this ridiculous facility by wearing orange today. I've just completed reading Greg Conti's well-written work Security Data Visualization: Graphical Techniques for Network Analysis . It's very important to note the subtitle there: "Graphical Techniques for Network Analysis" because, after introducing the topic of visualization in the first couple chapters, the book turns into network analysis full-bore. In general, this seems to be a good, useful book. Specifically, I think that it would be a very good textbook for a network security course, as the text spends a considerable amount of time in the earlier chapters introducing the reader to the basics of networking and network analysis, including providing high-level coverage of port scanning and network assessment with tools such as Nmap, Nessus, and Metasploit. Continue reading Non-Fiction Review: Security Data Visualization. Contrary to moron Bryant Gumbel (ala the NE/NYG game play-by-play), if the Patriots don't win the Super Bowl, then this year will have been a waste. I mean, come on, get serious for a moment, and consider this: does it matter how good your regular season was if you don't win the championship in the end? That's right, I didn't think you'd disagree. Of course it matters how you end the season. - If your offense is really clicking, then Randy Moss is a good WR to have on your squad. For reference, see the 1998 Minnesota Vikings. - Tom Brady is a very good quarterback. - Wes Welker has really blossomed as a clutch receiver. He's open at uncanny times, and really takes the pressure off some of the other receivers. - The New England linebackers demonstrate every week that age can be trumped by experience and desire. So, do I think they'll go all the way and win the big game? Yeah, probably. There is, however, a significant risk of choking under the pressure. It's one thing to go undefeated in the regular season, when nothing but records are on the line. It's another thing entirely to make it through the playoffs to win the championship when it will determine how your team is forever remembered. Sure, the '98 Vikings are remembered for a good offense, but that's about it, and they went 15-1 in the regular season (only the 3rd team to do so). As for whether or not the Patriots compare to the '72 Dolphins... that's hard to say, since the modern game is so much different from that era. Free agents, salary caps, etc., have made building a dynasty very difficulty. Pound-for-pound, I would imagine that the Patriots would make the Dolphins look rather small by modern standards. Could their running backs run all over the Pats? It's hard to know, but it seems unlikely. In the end, though, it'll all come down to the playoffs, and whether or not the Patriots can survive to true greatness. In keeping with my pattern of alternating between fiction and non-fiction, my next reading project is the non-fiction work Security Data Visualization: Graphical Techniques for Network Analysis . Thus far it's fairly interesting and, despite how heavy it is, seems to be a rather short, brief read. I recently completed reading The Bourne Ultimatum , the third book in the Bourne Trilogy by Robert Ludlum. Overall, the book was fine, though it seemed like it was reaching a bit too much. I mean, honestly, how many times can Jason Bourne and Carlos the Jackal foil each other and avoid death? So, in the end, I guess, it was rather a boring, repetitive end to the trilogy. If you've read the first two books, then I suppose you might as well finish the trilogy, but it's not absolutely necessary. The first two books are much better than this third attempt. If you're as fed up with the present White House administration as I am, and if you believe as I do that the VP seems to be the root of most evil these days, then I encourage you to join this cause. If nothing else, take 5 minutes to sign the online petition. If you're really feeling active, then you can contribute to the cause. Click the image at right for more information. Sounds like a winning combination to me. Especially if they're running against a scary, screwed up guy like Huckabee. Here we come 2008! It's hard to believe that 2007 (or 2006, 2005, 2004, etc.) has already come to pass. We were able to get back to our traveling ways this past year, but do not foresee being able to continue these ways as we shift our plans to starting a family. It will, however, be anything but a dull year, as we buckle down financially, finally getting some old debt paid off, and beginning to put money into savings and investments. The predictions of a recession in 2008 actually play very well to our hand in this regard, providing an opportunity to reduce some of our interest load, while also reducing investment costs to below what may be their actual value. If you're anything like me, you're probably exhausted here on the first day of the year. For me, there are a few reasons. The first reason was work-related. While AOL was very good to me, it was also extremely stressful. Since returning from vacation in August 2006, when I had a huge case dropped in my lap, things just went berserk from there, with a major restructuring, major layoffs, a complete change in executive management, and so on. That stress has been relieved by changing jobs, and I fully expect to recover. Continue reading Happy New Year!.